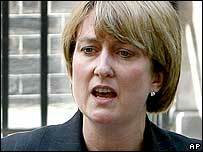 The UK will "not be intimidated" by terrorist attacks, Home Secretary Jacqui Smith has told MPs. In a Commons statement, she said it was "through our unity that the terrorist will eventually be defeated". Ms Smith spoke after the UK's reviewer of terror laws, Lord Carlile, suggested giving police longer to quiz suspects. Ministers are consulting on anti-terror plans ahead of a bill to be published in November. Gordon Brown said he would not be "rushing into" new laws. Ms Smith said: "My aim is to allow the British public to live their lives how they would wish within the law. "Our message to those who wish to destroy our way of life and freedoms is that we will not be intimidated by terror." Shadow home secretary David Davis praised Ms Smith's "calmness" in dealing with the failed car bomb attacks in London and at Glasgow Airport over the weekend. He added: "Handling this enemy will take very cool judgment, very careful analysis, and very thorough planning if we are to defeat them without giving up what we all hold dear. "This will take a long time, and will need co-operation between the government and opposition, a process which has already started." Earlier, Mr Brown's official spokesman said: "It's not a time for rushing into new legislation at the moment. "The prime minister is determined to ensure every action is taken to protect the public but he's equally determined not to be deflected from the main business of government." Ms Smith's predecessor as home secretary, John Reid, last month published a discussion document covering anti-terror measures being considered - including extending the 28-day limit of holding terror suspects without charge. Ms Smith told MPs: "There may well be a case for looking very carefully at the amount of time that we are able to detain people pre-charge in order to ensure the very best opportunity to bring convictions." Earlier, she said the government needed to "find not just the legislative approach, but other ways" to counter terrorism, including talking to all faith communities. Lord Carlile told BBC Radio 4's The World at One that the weekend's bomb attacks had given further weight to calls for the 28-day limit to be extended and for control orders for terror suspects to be toughened up. Such responses were "proportionate" to the current threat, he added. Ministers have said open-ended detention without charge - overseen by the courts - is a "very, very serious option" and that it is "worth exploring" tougher control orders. In 2005, Conservatives, Lib Dems and Labour backbenchers defeated plans to hold terror suspects for up to 90 days without charge. The Tories said a "cross-party approach" was needed and the Lib Dems praised Mr Brown for showing a "measured tone" in response to the crisis.